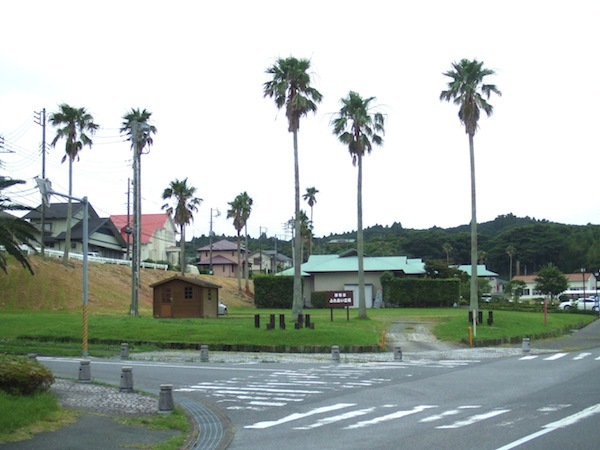 Green Town is also at least partially a weekend or summer community, though it’s laid out as a typical cramped Japanese housing development, albeit with more attention paid to the “green” component it promises. 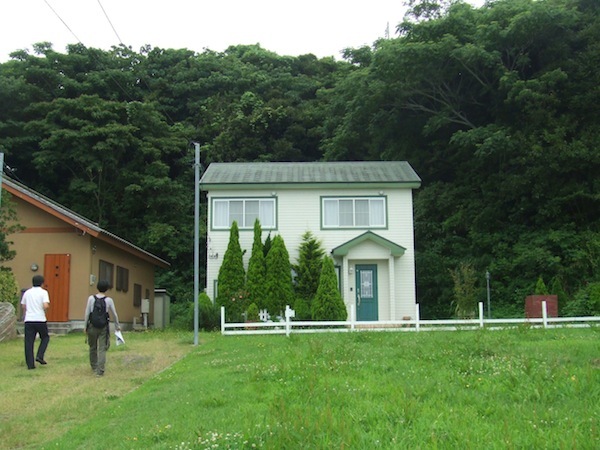 The developer is Seibu, and there are altogether about 1,500 lots, one thousand of which have houses on them. Half of these are owned by year-round residents, and thus the normal sterile atmosphere of modern Japanese housing developments is checked by a certain ramshackle quality. Some of the buildings are quite fine–and large–while others are modest and makeshift-looking. But while the stylistic tone is pleasingly varied, the overall feel is almost ominous. The day we visited was a weekday and summer vacation hadn’t begun in earnest yet, but the neighborhoods we visited were quite deserted. The only human activity was workers cutting grass or delivering LPG cannisters (despite the upscale appearance of the area, they don’t have gas lines). The real estate agent who guided us said most of the population was older, not because young people were moving out, but because only older people were moving in. (It’s not a town for commuters–Tokyo is an hour and 30 minutes away by super express) Apparently, older people don’t like to leave their homes in the daytime. The first house we inspected looked like something a year-rounder would live in, though the agent suspected (he didn’t know for sure) the owners were weekenders. In any case, they had cleared out a long time ago as evidenced by the powerful smell of mold when we walked in. The building was one-story on a sizable (368 sq. m.) chunk of land. 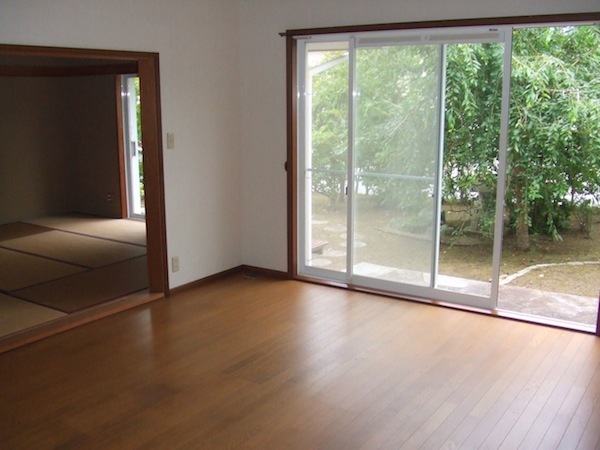 The floor area measured 120 square meters, liberally distributed through a sizable LDK with a high vaulted ceiling, an 8-mat washitsu, and two bedrooms, not to mention one of the most pointlessly large genkans we have ever seen. You could hold a small wedding reception in the foyer. The bathroom was also big, and there was a utility area behind the kitchen for the washing machine, which was quite nice. We’re not really crazy about the usual idea of putting the washing machine in the bathroom, but that’s what paucity of size usually dictates. The layout was good, and there was lots of storage space, including a huge walk-in closet off the main hallway. Despite a few skylights, the place was dim, but the day was also overcast. The floors were high-quality veneer that passed for real wood, and the west wall of the living was real wood. 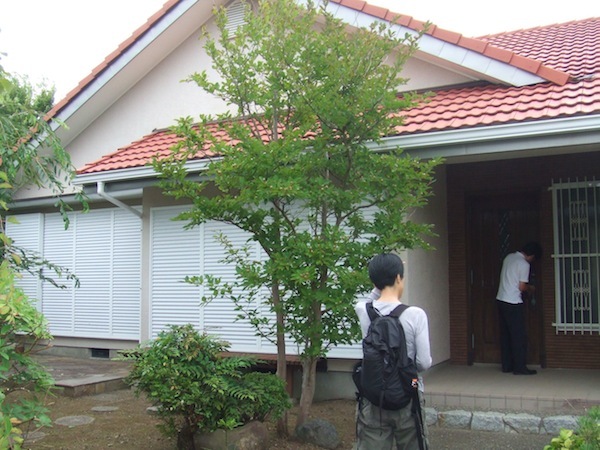 The price was ¥15 million, though the agent hinted that it could be negotiated down. In a way it was a deal, but we immediately rejected it for two reasons. One was that it was just too big and we knew the landscaping costs alone (fruit trees and lots of small bushes) would become a burden. The second was more signficant: though it was in pretty good shape for a house built in 1992 (it had obviously been recently painted) the fixtures were cheap. We’d end up spending lots of money over a long period of time changing them. For instance, the corner window in the dining area had a nice, unobstructed view of the park to the west, but the window casing was starting to come apart and the grouting/packing was already loose and falling off. The same applied to the other windows, which were all had flimsy aluminum sashes and were single-glazed. When we asked the agent if the owner would pay to replace any of these things, he said no. They would only sell the house as it was, which means we would have to pay for disposing of all the superannuated air conditioners, too. Suddenly, it wasn’t a deal any more. But even if these issues had been resolved, we probably would have rejected the property simply because of the neighborhood, which was conventionally tight. We were initially more interested in the second place we looked at, located on a lot at the edge of a wooded area on the top of one of the hills. It was a besso (second home) modeled after an “English country house” (the owner’s description, not ours). 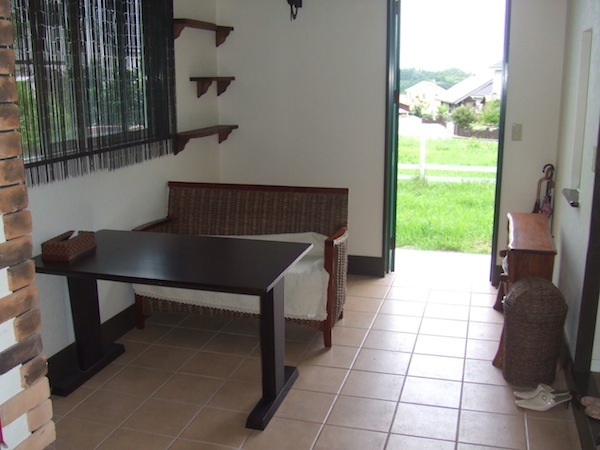 In the photographs we saw on various real estate portals it stood apart from its surroundings, mainly because the lot in front of it was vacant, making it look as if it had a vast front lawn (those wide angle lenses again). The description on the website also said that the second story had a clear view of the ocean. 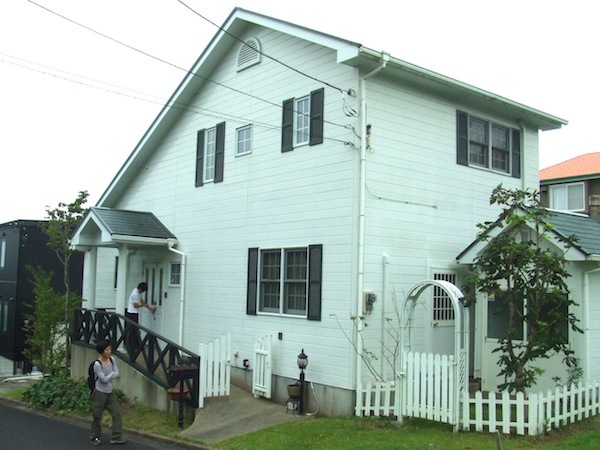 But more appealing to our conditioned contrarian taste was the fact that it had no genkan, and the living-dining-kitchen area was on the second floor, not the first. Needless to say, it wasn’t what it was cracked up to be. The front door opened on to a large foyer with a tile floor and fake applied-brick accents on the wall. The main room on the first floor had large sliding doors facing a small wooden back porch. The very large bathtub–hardly what one would find in an “English country house”–did have a nice big window but it was blocked by one of the tall shrubs that stood against the house’s facade. The second floor was much better, but the view of the ocean was only possible with a certain amount of neck-craning. Again, it was a cheap place. The English country pretense manifested itself in tacky ornamentation rather than layout or lifestyle choices. The only thing you could say about it was that it was simple, but there wasn’t enough there to improve on, even with a substantial investment. The owners obviously still used the place, since the closets were full, but they didn’t use it that often. We expressed concern about the open land, thinking that someone would eventually buy the front lot and build a house on in, blocking whatever perspective the country house enjoyed. The agent assured us that because of the way the lot was situated and the normal “preference” for southern exposures, whoever bought the land would likely position a house to the east side of the land, thus minimizing blockage. No matter. At ¥13 million it was not something we wanted any more. The third property turned out to be the most appealing. Located on a slope across the street from a very steep grade that rose up to a huge property with an honest-to-God mansion on it, the house had plenty of space on all sides. To the west was a vacant lot; to the east a brand new black galvanium-sided house that didn’t wreck the view, and to the south a large landscaped backyard. The house itself was two stories and deceptively massive-looking. When you walked in the front door you immediately stepped into a wide LDK area with the kitchen on the left. Directly in front was a wall of sliding doors looking out over a well-built wooden deck and the back yard. The ceiling rose up to the roof. The first floor also featured a large den and a workroom still cluttered with tools and other facilities for making pottery. In fact, there was a small shed to the west of the house that contained a genuine working kiln. We asked if it came with the house and the agent said it did. 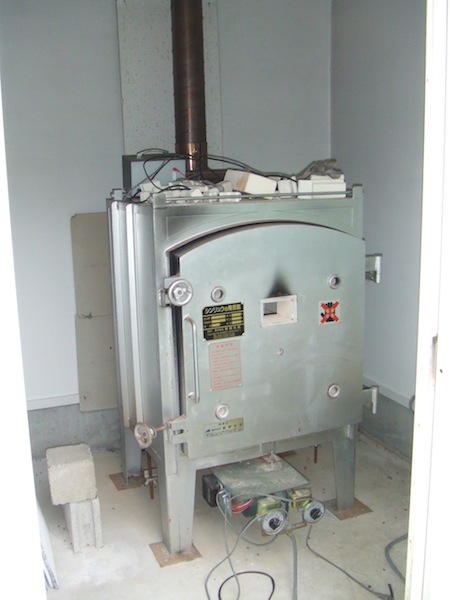 We’re not sure what we would do with a kiln. Make pizza? That would be like using a bazooka for pest control. The second floor only had one large bedroom with a loft (for storage, not sleeping), but also a toilet, which made it perfect for our purposes. But not perfect enough. 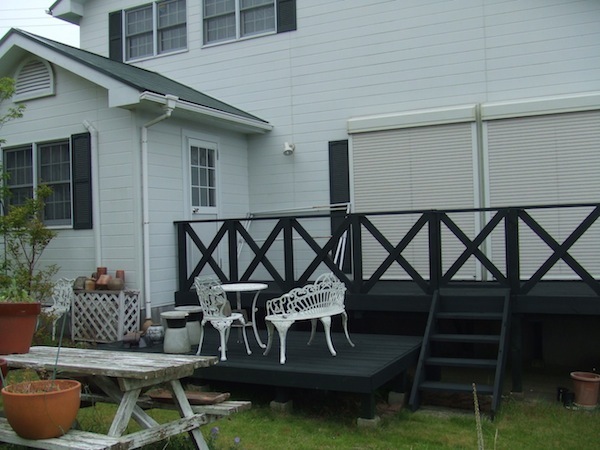 Though the house was built in 1998, the owners hadn’t really kept it up very well, except for the backyard deck. The floors on the first floor were stained and discolored and would need to be replaced. The walls were also is bad shape. As mentioned, the backyard was quite large–the whole property covered almost 400 square feet–and taking care of it would have been beyond our ability. This is, of course, a realization we’ve slowly come to during our search: that we’re not the gardening/maintenance types. As much as we’d like to own a house, we understand that taking care of one requires money and time, something that economists neglect to point out when they preach the gospel of home ownership. It’s also a matter that comes into play when you’re buying a used home: most of the ones we’ve seen have lost their value and their appeal simply because the owners didn’t take care of them. After all, that’s the only way to retain the value of your home. We’ve said so many times on this blog that Japanese homes are not an investment because you will never be able to sell one for the same price you paid for it unless you live in the center of a major city. And for sure, the main reason for this situation is that the quality of Japanese homes, or at least those built before, say, 1995, is inferior. But either because of laziness or a certain streak of fatalism, homeowners in Japan don’t keep their places up, and it’s something you’ve got to do. We said goodbye to the agent and walked down the hill into Onjuku proper. It was cool and still overcast and we strolled along the beach and then had lunch in a little fish restaurant that was quite good. It’s a pleasant town, and a great place to spend a weekend or even the summer. Not sure if we want to live there, though, as cool as it is. 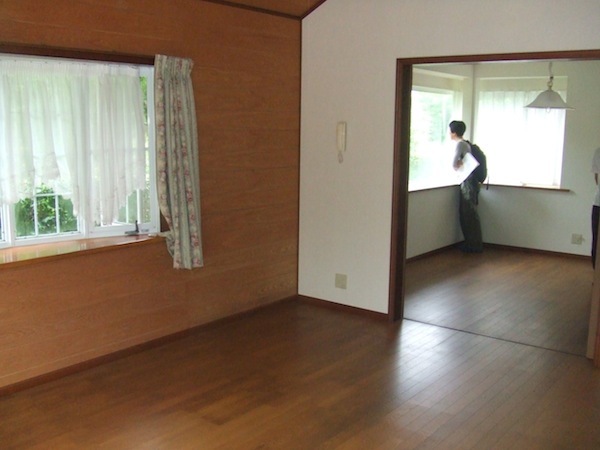 House shopping in Japan must be interesting. There’s no real threat of appreciation via interest rate drops, real disposable incomes rising, or population growth — quite the opposite! The working-age population is going to shrink by the equivalent of Hokkaido by the end of the decade, it looks like the government is going to have to start raising taxes finally, and interest costs are already rock-bottom thanks to the longstanding ZIRP. shows how Japan has hit the wall, housing-wise. If I were looking for a house in Japan, I’d just want to ship the components over in 20′ containers and build the damn thing to my own standards — I have yet to step foot in a Japanese house worth the sticks (except for the blue tile roofs, I like those). I sense some resignation in this post. Nonetheless, the point about renovation is important. Just the other day on the way home (Chuo line) I looked out of the window just one or two stops from Shinjuku and saw houses that look have the appearance of slums, dirty old walls, frosted glass windows, tin roof; more akin to something you would see in the Philippines or Malaysia or some other second-world country. I suspect that the appearance of these residential parts of Japan and Tokyo will deteriorate even more given the trends. As the government introduced an eco-point system for trying to improve the energy efficiency of households, some kind of scheme to enhance the outward appearance of houses would also be greatly appreciated. However, I suspect that the hours people work here and the lack of any kind of stigma in living in a tatty looking house will lessen the applicability such efforts, unfortunately. I’m curious to know if you are considering solar energy as a part of your house purchase. I am currently getting more educated on the issue and from my perspective, there are many things to like about it, especially now. I wonder, for example, if you look at how much of the roof faces in a southerly direction and how much sunlight it would receive annually. I am also curious to know if you see any new houses with all denka and a solar system pre-installed starting to pop up on the market. I would imagine that is still not happening yet, but I wonder if the topic is something real estate agents bring up at all, and or are ready to talk about when you visit a house. We bought our house in Makuhari last year in August and it turns out, by pure luck, we have a pretty good roof for solar especially considering the size of our house. I’m still a little too concerned with the situation at the 4th reactor of Fukushima daichi to install any panels in the immediate future but, considering the government’s 10 year FIT program, the advantage to going green gets slightly smaller with each month that passes after July 2012. Anyway, I am curious to gage what kind of interest there is (or isn’t) in solar from your experiences. Any feedback would be interesting to read. Thanks for considering it. Hi, now that the government has approved raising the consumption tax up to 10% over the next couple of years, I wonder if this will create a small rush to buy homes before the increase, thus, increasing housing prices in the next several years? Perhaps. The consumption tax increase will likely not affect the used housing market very much since the people selling used houses tend to be owners, and unless they are businesses that make over ¥10 million in sales a year they don’t have to charge consumption tax. The realtor’s fee will have tax added, but that’s usually about 3% of the property price. Where there will probably be a rush is in new housing, since those are sold by developers and thus will have consumption tax added.